Every year Child Welfare Tshwane invites the community of Pretoria to give only 67 minutes of its time on Mandela Day, 18 July, towards inspiring individuals to instil positivity within the community. The Department of Business Management accepted this invitation and, in collaboration with local small business H Brian Customs MAG/RIM Repairs and Car Sales, celebrated Mandela Day at the Child Welfare Tshwane service point in Sunnyside. 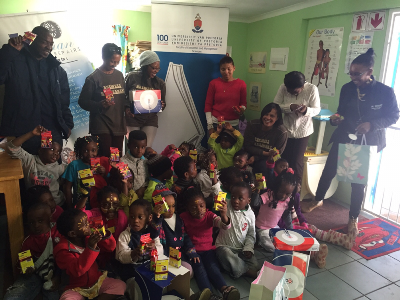 The wish list for the service point’s children focused on the educational needs of the crèche, which included toys, games, stationery, reading books, scrap paper for drawing, white boards, and white board markers. The Department donated two boxes of paper and H Brian donated boxes of crayons to the service point’s children. In this way an investment is made in the education of our children. We hope that it will make a positive contribution towards their future and that one day they will consider studying at a tertiary institution such as the University of Pretoria. According to Child Welfare Tshwane, the organisation aims to provide a safe home environment to every child in Tshwane. They want to protect children and ensure that they have the opportunity to reach their full potential. Sunnyside is a densely populated community, consisting mainly of high-rise flats, with 80 % of the population being of African descent. Given the affordability of the housing, a high percentage of the community’s residents are part of low income households. Malnutrition is on the increase and substance abuse and crime is rife, which emphasises the urgent need for social services, particularly providing safe and protected environments for children after school. Theodora Morris, Tshidi Mathibe and Menisha Moos from the Department of Business Management, Laiyekinne Morris and Enos Molapo from H Brian with the children and staff of the Child Welfare Tshwane’s Sunnyside service point.